Whether you love or loathe Google’s mobile operating platform, one of the great positives of Android is that, since it’s open-source, literally everything can be customized and tweaked to the nth degree. While the likes of iOS offer little hope to those looking to make a few vanity house changes (unless, of course, you’re jailbroken), Android has quite a few options for you to get your creative game going. 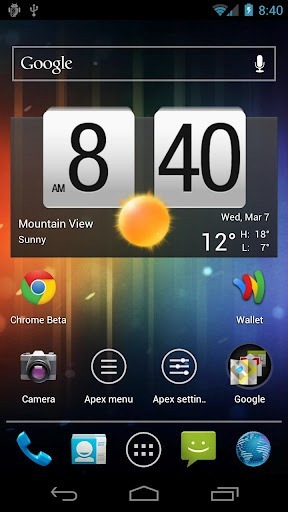 Launchers are the most commonly-utilized manner in which Android users personalize the way the screen looks once that Home button is engaged. Another overt advantage of using these launchers is that, contrary to what might seem, literally anyone can use them, since there’s absolutely no modding or tech-specific steps involved; simply download, install and away you go. Last week, we brought forth TSF Shell – one of the best launchers we have seen here at Redmond Pie, but it was rather significantly handicapped by it’s dumbfounding $17 price tag. 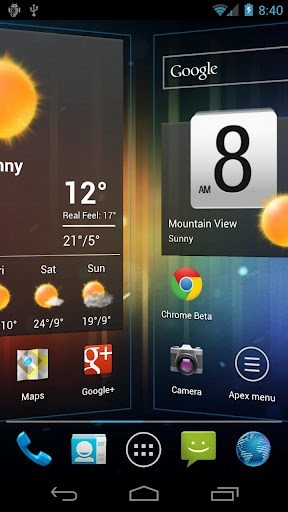 So for those of you not looking to spend such an extortionate amount on a launcher, we present Apex – a recently-updated launcher for those running Android 4.0 or higher. As well as the expansive feature set, improved homescreen management and additional transition effects for the homescreen and drawer are also in the pipeline.